In 2012, FMPP supported the launch of Adelante Mujeres’s Sabor Color commercial kitchen project. This project focused on training small food producers and processors to develop culturally appropriate foods from local ingredients. FMPP grants invest in marketing activities for farmers markets, roadside stands and other direct producer-to-consumer businesses. This year, 50 FMPP grants were awarded to projects across the country to help meet the local food demand and increase access to healthy local food. LFPP funded 52 projects that support local food businesses that distribute, aggregate, or store locally or regionally produced food products. LFPP funding will also assist a diverse population through projects that develop, improve, and expand local and regional food business. These grants support the local food sector and create jobs, helping to strengthen the rural economy. When looking at the broader picture of impact, it’s clear that FMPP and LFPP support growth across America’s diverse agricultural communities. A significant number of these grants—82 percent—will help increase marketing opportunities for new and beginning farmers. 72 percent of the grants will help support women in agriculture. The positive impacts can be seen from past grants such as the one received by Adelante Mujeres, an Oregon-based non-profit dedicated to empowering Latina women and their families by promoting community participation and leadership. In 2012, FMPP supported the launch of Adelante Mujeres’s Sabor Color commercial kitchen project. This project focused on training small food producers and processors to develop culturally appropriate foods from local ingredients. 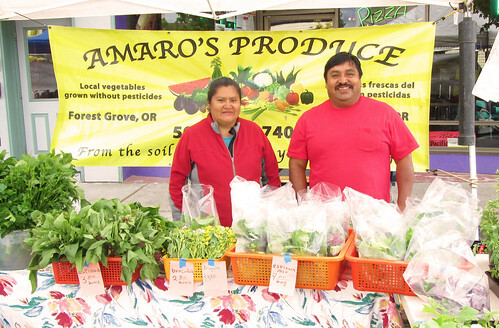 Successful trainees launched 6 food businesses selling their products at the Forest Grove Farmers Market, and half of the businesses also sold at additional markets. By late 2013, Adelante Mujeres had trained 26 individuals on food safety and preservation techniques and other types of food handing. 18 training participants were developing their own food businesses. Adelante Mujeres also added commercial kitchen space in the nearby town of Beaverton to meet the demand for community kitchen access. USDA is proud to be a partner and supporter of local and regional food systems through our programs, grants and technical services. Under this Administration, USDA has invested more than $1 billion in over 40,000 local and regional food businesses and infrastructure projects. As we continue to support the marketing and distribution of locally-produced foods for U.S. farmers and ranchers, we’re hearing from communities that these investments are having an impact. This work contributes to USDA’s Know Your Farmer, Know Your Food (KYF2) initiative, which coordinates local food efforts across USDA. Our recently-revamped website provides USDA resources for every point in the local food supply chain, including grants, loans, research and other resources. Additionally, the KYF2 Compass maps USDA’s local and regional food investments across the country and can help you see how other communities are using these resources to build strong food systems. More information on how USDA is connecting producers with consumers and expanding rural economic opportunities through local foods is available in Chapter IV of USDA Results on Medium.